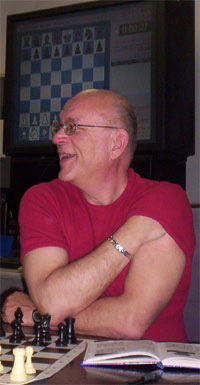 Kenilworth Chess Club Champion and FIDE Master Steve Stoyko lectured in the club's skittles room on Thursday, April 21, 2005. He played over and discussed some of his games published in Dr. Orest Popovych's book featuring games by former champions of the Ukrainian Sports Federation of the USA and Canada (USCAK) -- which Steve has won several times. Instead of the standard demo board, Steve played his moves on a regular board and they were shown on the widescreen television monitor using the Fritz interface. Each move thus had both human and computer analysis. In some ways, the lecture became a commentary on the limitations of computer thinking, since Fritz found many of Steve's deepest combinations and ideas unfathomable given its relatively limited horizon. You can play through the games and commentary below using the Palmede Java viewer, or go first to the four quiz positions from these games. You can also download the PGN file of all games and annotations using the links at the bottom of the page. FM Steve Stoyko lectures with Fritz running in the background. Black to move and win. Black actually has two strong ways to break through on the queenside and win material. Black to move and win. Steve has been targetting the pawn at e4 and White has brought his pieces to its defense. How can Black apply more pressure to win it? White to move and win. How can White most quickly bring his pieces to the kingside for attack? How can Black continue the attack on the White king and at least win material? Steve prefaced his remarks by praising our current "Dean of American Chess" as a great endgame player. He then pointed out that he has a plus record against the Biscuit because he never lets the game get to an endgame. This game was played in the last and decisive round of the Virginia Open. In winning the game, Steve took the title.